If you are a person of a certain age, you probably have fond memories of singing along with Schoolhouse Rock’s “I’m Just a Bill” between favorite Saturday morning cartoons. That catchy tune has been inspiring legislative advocacy for decades now. But do you still remember how a bill becomes law? In the video, it seems easy for the cute little scrap of paper to become a real law. In reality though, there are many obstacles and the whole process can take anywhere from a few weeks to many years. Let’s take a closer look at the basics of policy making in the US and where you can get involved. Remember Members of Congress won’t work on competitive, integrated employment issues unless we ask them to! Understanding how laws are made is an important first step in effective legislative advocacy. Below is an outline of how it works at the federal level. Keep in mind, though, that it is equally important for you to understand your state’s legislative process. The path that a bill may take is determined by procedural rules, and there are many. This is a simplified version of the process. A bill is simply a law that is waiting for approval. A bill may originate in the House of Representatives or the Senate, depending on what type of bill it is. A member of Congress introduces the bill. Once the bill is introduced it is assigned a bill number, with this number you can track the bill’s progress. The bill goes to committee. The bill is assigned to the committee with appropriate jurisdiction where it is revised and amendments are considered. For example, the AHCA was assigned to the House Energy and Commerce and the Ways and Means Committees, both of which have jurisdiction over the bill. The bill goes for a floor vote in the House or Senate. Or it may never see a floor vote at all. Now the bill is debated by the full membership of the House of Representatives or Senate before holding a full vote. The bill will only get a floor vote when the majority party is certain that it has enough votes to pass. The bill goes to the House or Senate. The above process repeats for the other chamber. After a bill is passed in both the House and Senate, it goes to a conference committee to work out differences if needed. The bill goes to the President. After a bill passes both the House and the Senate and is conferenced, it goes to the President. The President can either sign the bill into law or veto it. If 10 days pass and the President fails to take any action, the bill becomes law. 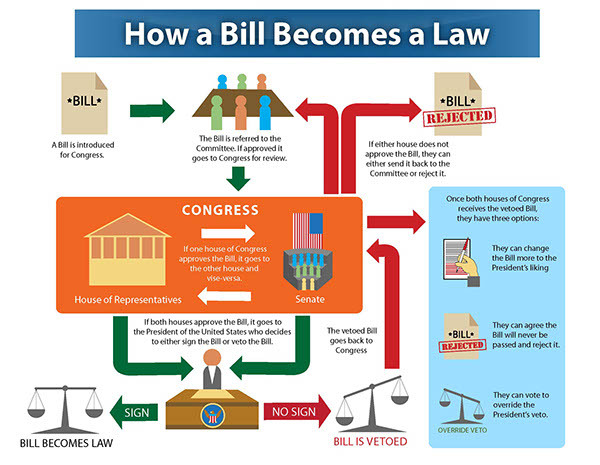 For a more detailed description of this process and to learn more about how Congress works, take a look at the website for the House of Representatives. At what point in the above process is advocacy most important? The truth is, advocacy happens the entire time. It is not something that is limited to specific legislation or a specific point in the legislative process. Policymakers deal with many issues at once, so they rely on their staff to stay informed. It is important to develop and maintain ongoing relationships with staff to keep them up to date on your issues and to rely on you as experts and resources. APSE has a legislative agenda and strategy in place around every issue that impacts its members. Please use these materials and modify them for your state. APSE can also support your chapter in developing specific advocacy materials. Advocacy is most effective when there is a consistent, concerted effort on the part of many to communicate a singular message. Checkout APSE’s Legislative Advocacy Center for more recommendations. Even if you’ve never spoken to a legislator before, you have all the skills you need to be an effective advocate for yourself and those you love. Ultimately, being an effective advocate is all about establishing a relationship with your member of Congress and their staff. Contact your Representatives and Senators: Even if your Representatives and Senators are good advocates, it does no good to contact politicians for whom you have no opportunity to vote. Encourage individuals in other states and districts to contact their legislators as well. Make appointments with key House and Senate staff: It can often be hard to get the ear of your legislator, but listening to constituents and reporting back to legislators is delegated to key staff members. Take the time to get to know your legislators’ staff. Be concise: Members of Congress have many responsibilities, including legislative policy issues, constituent services, public availability, and campaigning. You are more likely to have your message heard if you are brief and make your story personal. Focus on only one issue in each communication: Don’t put forth a laundry list of issues you want to see changed. A single pointed email about a relevant piece of legislation is most effective. Ask for something specific: Have in mind an action item that is realistic. Be sure to say thank you: After a meeting, or when a vote goes your way, be sure to recognize your representatives and publicly praise their responsiveness to the community. A hand written thank you note to your legislator and their staff is always appropriate. Keep copies of emails, letters, and notes for future reference: It helps to be able to reference specific quotes and points whenever the issue comes around again in future legislation. Follow-up and stay in touch: Developing a relationship requires persistence. It takes time, so don’t expect one phone call, email, or op-ed to be enough. When you are making your pitch, bear in mind that every House member runs for office every two years and every Senator runs for reelection every six years. This means that every Member of Congress is either running for office or getting ready for their next election. This reality pervades everything that they do. Constant pressure to be re-elected means that members of Congress are extremely sensitive to their image in the district or state and they work hard to avoid signs of public dissent or disapproval. They want to project the image that they care about their constituents, share their values, and are working hard for them. This does not mean that your Member of Congress is cynical and unprincipled. The vast majority of people in Congress believe in their ideals and care deeply about representing their constituents and having a positive impact. However, they also know that if they want to make change, they need to stay in office. Being an effective legislative advocate takes time, effort, and a whole lot of stamina. But no one has ever claimed that change is easy. APSE, your legislative advocacy partner, is here for you. Join us! Infographic attribution: Provide by behance.net and created by Rjay Juarez.